5 years or more from the start of the work and the onset of the disease. Applying this new guideline, Mr. Masao Yoshida, ex-plant manager of Fukushima I Nuclear Power Plant who developed an esophagus cancer will not qualify. His cumulative radiation exposure is supposed to be 70 millisieverts, and his health check prior to the accident didn't reveal he had a cancer. On September 28, the Ministry of Health and Welfare announced the guideline for evaluation of three types of cancers, stomach, esophagus, and colon, when evaluating the applications for workers' accident compensations by radiation workers at nuclear power plants and medical facilities. The main points in the guideline include 'cumulative radiation exposure of 100 millisieverts and higher', '5 years or more between the start of the work and the onset of the cancer. There was no guideline for these cancers to determine the relationship between the radiation work and the onset of the diseases. Upon receiving the application from two people who claim they developed cancer because of their work at nuclear power plants, the Ministry's committee compiled the guideline from the past epidemiological studies. One person developed two types of cancer, and submitted the application on December 2009. The other person developed one type of cancer, and submitted the application in February last year. The Ministry hasn't disclosed the name of the cancer or whether the applications have been approved or not. The Ministry also disclosed that a worker who had worked in the restoration work during the Fukushima I Nuclear Power Plant accident submitted the application for workers' compensation this month, claiming he developed a cancer. According to the Ministry, it is the first time that a worker at Fukushima I Nuclear Power Plant has submitted the application because of cancer after the March 11, 2011 disaster. In case of workers at nuclear power plants, particularly those workers who hop from one plant to another doing maintenance work, cumulative radiation exposure of 100 millisieverts may not mean much at all, because the official numbers on their radiation worker handbooks may not mean much at all. But when it comes to official compensations, what matters is what's officially on the books, and their claims may be rejected as the "official" numbers may be well below 100 millisieverts. A publicity stunt to appeal his commitment to the resolution of the nuclear accident. It was revealed on September 29 that Prime Minister Yoshihiko Noda will schedule a visit to Fukushima I Nuclear Power Plant on October 7. He will reshuffle his cabinet on October 1, and by going to the plant as the first visit after the reshuffle he hopes to emphasize his commitment to have the Fukushima nuclear accident as his first priority. It will be his first visit to the plant since September 8 last year. The prime minister wants to meet and thank the workers who remained at the plant after the nuclear accident started and tried to contain the damage. The workers, who did their best to prevent the damage from spreading in a dangerous situation, have been praised as "Fukushima 50". So... It takes the prime minister of the country one and a half year to thank the workers who stayed at the plant to try to contain the accident. If I remember right, from last year, "Fukushima 50" workers were not praised in Japan first. I don't think many Japanese were even aware of them. Foreign media, mostly in the US and UK, reported the desperate work going on at Fukushima I Nuke Plant in March last year, calling the workers who remained at the plant "Fukushima 50" and praised them as heroes. The news was imported to Japan, and the Japanese media started to report about the workers and their work at the plant (here's Asahi, on April 10, 2011, my translation). Yakuza or not, these workers worked in the middle of the worst nuclear disaster in Japan. So far, the only recognition these workers got is foreign - Spain's Prince of Asturias Award for Concord in September 2011. In case you missed, here's what ex-Plant Manager Masao Yoshida said about those early days, when he saw divine figures sprung out of the ground and became the workers (here and here). Live netcast started about 20 minutes ago. They are in the Kaiseizan Park right now. 1.4 microsievert/hour on the grass. They are saying Koriyama's radiation seems to be higher than in Fukushima City. Foreign Minister Yang Jiechi repeated China's claim that "Japan tricked China into signing a treaty" and stole the islands. China's UN envoy Li Baodong said the Japanese government’s purchase of the islands was based purely on "the logic of robbers". Foreign Minister Yang Jiechi sparked angry exchanges with Japanese diplomats at the United Nations on Thursday by accusing Japan of stealing disputed islands. The Japanese government’s purchase of the uninhabited islands from a private owner this month has infuriated Beijing and set off violent protests in several Chinese cities. “China strongly urges Japan to immediately stop all activities that violate China’s territorial sovereignty, take concrete actions to correct its mistakes and return to the track of resolving the dispute through negotiation,” Yang told the UN assembly. China has demanded the return of the uninhabited islands, known as the Diaoyu in Chinese and the Senkaku in Japanese, for decades. Taiwan also claims the islands. Yang reaffirmed his country’s historical claim that Japan tricked China into signing a treaty ceding the islands in 1895. Japan states that the islands were legally incorporated into its territory. “The moves taken by Japan are totally illegal and invalid. They can in no way change the historical fact that Japan stole Diaoyu and its affiliated islands from China and the fact that China has territorial sovereignty over them,” said the Chinese minister. Japan’s move was in “outright denial” of its defeat in the second world war, he added, reaffirming China’s repeated references to the 1939-45 war. Yang and Japan’s Foreign Minister Koichiro Gemba held stern talks on the dispute in New York on Tuesday, and Yang’s speech sparked sharp exchanges between Japanese and Chinese diplomats as each sought a right of reply. “The Japanese government still clings to its obsolete colonial mindset,” Li added. “China is capable of safeguarding the integrity of its territory,” the ambassador warned. The Japanese government’s purchase of the islands is based purely on “the logic of robbers,” he stormed. In the meantime, Zero Hedge has an article from the same paper about potential bankruptcy of a boom town in Guangdong Province. The video starts after a 130-mm diameter hole was drilledAt first, nothing seems to be happening, until 50 seconds into the video when the aperture of the ball valve opens. What you see at the end of the hole is the inside of the Reactor 1 Containment Vessel. The camera gets inserted at about 2 minutes into the video. The inside seems to be filled with whitish smoke or steam, though it doesn't look dripping wet like in Reactor 2's Containment Vessel. At about 4 minutes, some sort of structure is discernible. At 5 minutes, a rust-colored wall starts to appear on the left side of the screen. At about 18 minutes, the camera focuses better, and you start to see what looks like metal and concrete(? it may be mangled metal) debris. What destroyed the inside like this? Earthquake? Explosion? 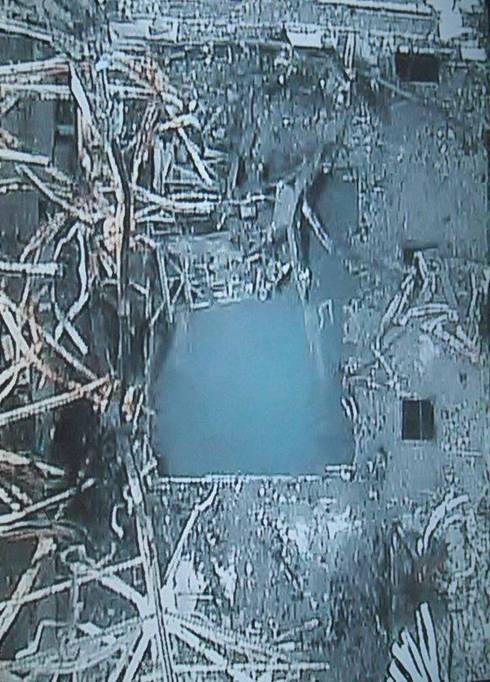 TEPCO used Penetration X100B, which is on the northwest corner of the Containment Vessel above the equipment hatch door, not the high-radiation southeast corner. In June this year, TEPCO did the survey of the Reactor 1 torus room, where they found the radiation level just above the water surface to be over 10 sieverts/hour. If Liberal Democratic Party wins back the next election (Lower House, to be held sometime next year), he will be the prime minister of Japan for the second time. 5 years ago, he simply quit as the prime minister and LDP leader after encountering some minor difficulty in negotiating with the opposition (DPJ). He is an elite from a political family which has produced prime ministers and councilmen. His own father was the foreign minister under Prime Minister Nakasone. Reading his profile on Japanese wiki, he looks and sounds like a typical "third generation". The LDP leadership election was held on September 26, and after the final round of voting, former Prime Minister Shinzo Abe, who was the 2nd in the first round of voting, won the election by defeating Mr. Shigeru Ishiba, former chairman of the party policy bureau. It was the first time in 56 years that the candidate placed 2nd in the first round won in the final round. For Mr. Abe, it will be the second time as the party leader since he resigned the same position in 2007. It will be the first time for the party to have the party leader who resigned from the post before, since the party was formed in 1955. In case you are not aware, despite the official name the party is not "liberal", just like DPJ under Yoshihiko Noda has been shown to be not "democratic". Now, Prime Minister Yoshihiko Noda as the leader of DPJ elected by overwhelming majority of the party has appointed Goshi Hosono as the party's new policy bureau chairman, replacing Seiji Maehara (whom many call a puppet of the US). As the result, Goshi Hosono resigned as the minister in charge of nuclear accident and focus on the election strategy for the party. So much for his word that he decided not to run for the DPJ leadership election because he wanted to focus on the Fukushima I Nuke Plant accident and the cleanup effort. Also, Finance Minister Jun Azumi will resign, as he becomes the deputy secretary-general of the party. Not much loss here, as he is a rank amateur when it comes to finance and economy. So, as far as the politicians in Japan are concerned, the Fukushima I Nuclear Power Plant accident looks to be totally behind them. It is indeed a "post-accident phase" they are in, as IAEA's Director-General Yukiya Amano said the other day, 1,660 Bq/kg of radioactive cesium in apples in Chiba notwithstanding. GE-Hitachi Nuclear Energy will build a facility on its global headquarters in Wilmington, North Carolina, based around a novel laser technology from Australian company SILEX that will enrich uranium (U-235) up to 8% by weight. It looks like a research facility. But the rumor a while ago that Hitachi, and GE for that matter, want to pull out of the nuclear business was, just a rumor, it seems. WILMINGTON, N.C.--(BUSINESS WIRE)-- GE Hitachi Nuclear Energy's (GEH) Global Laser Enrichment (GLE) today announced receipt of its license from the U.S. Nuclear Regulatory Commission (NRC) to build a groundbreaking laser enrichment facility on the 1,600-acre site of the company's global headquarters in Wilmington, N.C. While a commercialization decision must still be made by the company, the license enables GLE to build a first-of-its-kind uranium enrichment facility using lasers conceived of by Australian technology company SILEX and developed by GLE experts. The company has worked with the NRC, the U.S. departments of State and Energy and independent non-proliferation experts for several years to ensure the security of this technology and has met—and in many cases exceeded—all regulations pertaining to safeguarding this technology. "Receiving our NRC license is a tremendous accomplishment and strong testament to everyone involved in this project," said Chris Monetta, president and CEO of Global Laser Enrichment. "The technology we've developed could be one of the keys to the nation's long-term energy security. At a minimum, it could provide a steady supply of uranium enriched right here in the U.S. to the country's nuclear reactors. These reactors provide approximately 20 percent of the nation's electricity today and will continue to be an important part of the energy mix for decades to come." Today, a majority of enriched uranium made to produce nuclear fuel in the United States comes from foreign or government-supplemented sources. The GLE license, applied for in June 2009, will allow the laser enrichment plant to produce up to 6 million single work units (SWU) per year in the United States. The next step in the process is for the company to make a commercialization decision. This decision will be based on several factors. WILMINGTON, NC (WWAY) -- The Nuclear Regulatory Commission today issued a license to GE-Hitachi Global Laser Enrichment LLC (GLE) to build and operate a uranium enrichment plant using laser technology in Castle Hayne. The license authorizes GLE to enrich uranium up to eight percent by weight in the fissile isotope U-235, using a laser-based technology. It will be used in fuel for commercial nuclear power reactors. GLE plans to build the plant at the site of GE-Hitachi's existing Global Nuclear Fuel-America's fuel fabrication plant. "Receiving our NRC license is a tremendous accomplishment and strong testament to everyone involved in this project," GLE President and CEO Chris Monetta said in a statement. "The technology we've developed could be one of the keys to the nation's long-term energy security. At a minimum, it could provide a steady supply of uranium enriched right here in the US to the country's nuclear reactors. These reactors provide approximately 20 percent of the nation's electricity today and will continue to be an important part of the energy mix for decades to come." The approval comes more than three years after GLE submitted its license application and after safety and environmental reviews by the NRC. There's no word when construction will begin. The company says "the next step in the process is for the company to make a commercialization decision. This decision will be based on several factors." It did not elaborate on those factors. The NRC staff will conduct inspections during the construction and operation of the GLE facility. The agency plans to hold a public meeting in Wilmington before construction begins to explain its oversight plans to the public. When I saw the tweet, I thought it was another prank. The tweet had a link to a PDF file about the high levels of radioactive cesium in one tree in the yard of a resident in Abiko City located on the west corridor of Chiba with relatively high radiation contamination. The web address of the link indicated it was from the city government, but there was no mention of the city in the document. So I went to the homepage of Abiko City, and see if I could find the same document from the links at the homepage. The apple in question was brought by a city resident and tested on August 20, 2012 using the city's NaI scintillation survey meter. As the number was extraordinarily high, the city sent officials to the resident's home to collect more samples and tested them using the germanium semiconductor detector to be more precise. The result using the germanium detector was even higher. The city says it was cautious in releasing the information, for fear that it might generate "baseless rumors". The amount of radioactive cesium in the apples, leaves and branches from the particular tree was extremely high, and couldn't be explained by comparing it to the samples taken in the same yard and in the neighborhood. The apple tree is an ornamental apple tree, though the fruit is edible. It was planted by the resident of the house about 6 years ago when the resident moved in. The resident brought the apple to the city's testing lab, and the test was conducted on August 20, 2012. The city decided to release the information with a caveat that the apple was from a home garden and not commercially sold, so that people wouldn't panic unnecessarily. So no one knows why this one particular apple tree ended up with such a high level of contamination and not the tree right next to it. But aren't scientists curious? The Philippines and China agreed to prevent further worsening of their relations even as both reiterated claims on a disputed territory, the Southeast Asian nation’s Interior Secretary Mar Roxas said today. “Irritants continue to be present,” Roxas told a televised briefing in Manila, adding Chinese ships remain in Scarborough Shoal, an area being claimed by both nations. Roxas met with Vice President Xi Jinping last week and he said the discussions ended with a mutual expression of sovereignty. Back- door talks with China helped ease tensions, President Benigno Aquino said on Sept. 21. “I don’t expect much progress in the interim until that leadership change has been completed,” Roxas said, referring to China’s leadership transition. China also says it is cooperating with South Korea to further pressure Japan on the territorial claims, according to Nikkei Shinbun (9/25/2012). According to the paper, the foreign ministers from China and Korea got together and talked in New York as they were in town for the UN General Assembly. They agreed to put pressure on Japan by let the whole wide world know the "correct history" at the UN meeting. Japan's Prime Minister Noda will address the assembly on September 26. The Korean foreign minister says his country will see what kind of speech PM Noda will make, and will respond accordingly in the Korea's speech on September 28. TEPCO says they didn't find a piece of metal on top of the fuel assemblies in the pool (1st video), so they looked at the bottom of the pool (2nd video). They did find a piece of metal, but they say they are not sure whether that was the one that dropped into the pool on September 22 or that had been there since the explosion in March last year. Unlike the Reactor 4 Spent Fuel Pool (with 1331 spent fuel assemblies and 204 new fuel asssemblies), the Reactor 3 Spent Fuel Pool has only 566 fuel assemblies (514 spent, 52 new, and there was no MOX fuel in SFP) with the capacity of 1220. Since the metal slid from the edge of the pool and likely went down straight from there, there was probably no fuel stored where it fell. Hopefully. In addition, there are 6375 spent fuel assemblies in the Common Spent Fuel Pool. In the video below, released by TEPCO on September 24, 2012, the accident happens toward the end, at about 3:30. The crane grabber couldn't get a good grip on a relatively small piece of metal right on the edge of the pool, and the metal piece slid into the pool with a small splash. Oops. There are two video cameras fitted on the boom of the crane. 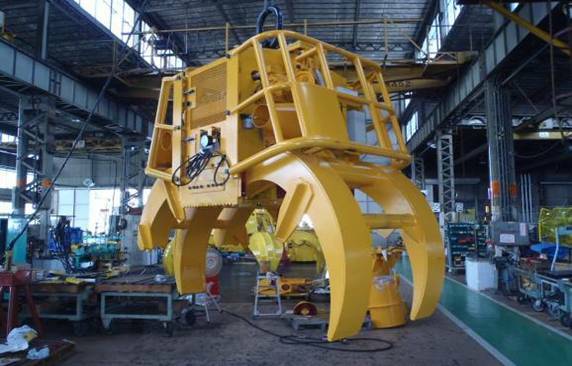 Looking at the other short video below and the photographs that TEPCO also released on September 24, I can't fault those Kajima workers who are operating these machines and tools by remote control. It looks extremely awkward and difficult to do. 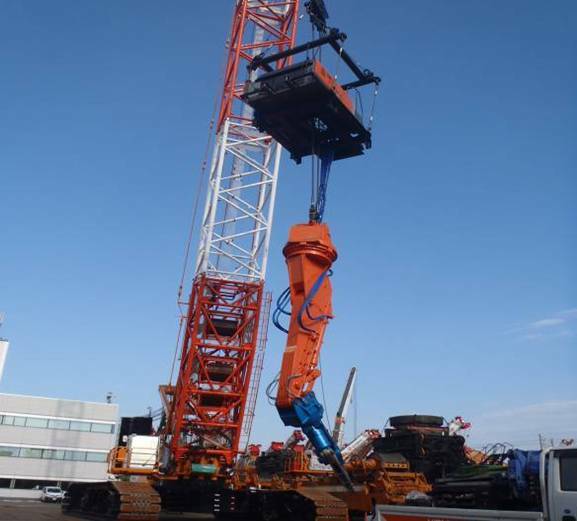 The remote-controlled hydraulic shears cut the metal held by the remote-controlled grabber, both dangling from the crane by wire. The worker who's been tweeting from Fuku-I since March last year said in his tweet that the workers wearing tungsten vests were braving the extremely high radiation and high heat of the summer to clear the debris enough to do the final assemble of the platforms. And he says, "...but no one reported it." Instead, TEPCO gets comments like "They don't have a shred of credibility", for which I feel sorry for the workers, TEPCO and subcontractors alike. 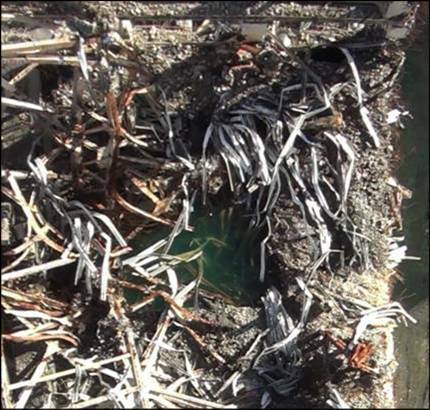 TEPCO also released the videos of inside the Spent Fuel Pool. See my next post. So says the Fukushima prefectural government, after more than one and a half year since the start of the Fukushima I Nuclear Power Plant accident. Supposedly, it took them all these days to analyze the data that was retrieved from the 19 monitoring posts around the two nuclear power plants (Fukushima I and II), and only now the prefectural government is sheepishly admitting the radiation levels were much, much higher than it has been telling the residents. What's more, though the prefectural government doesn't say it explicitly, the spikes in radiation levels correlate not to the explosive events but the vents, if you look at the charts published by the Fukushima prefectural government. On September 21, Fukushima Prefecture announced the result of air radiation survey conducted in March last year around Fukushima I Nuclear Power Plant. The reading in Kamihatori in Futaba-machi, 5.6 kilometers northwest of the nuclear plant, was 1,590 microsieverts/hour, highest so far outside the plant as the prefectural government knows. The result was compiled from the data from March 11 to 31 last year that remained in the 19 monitoring posts installed near the nuclear power plant. In Yamada in Futaba-machi, it was 1,020 microsieverts/hour at 12AM on March 16, 2011, and it was 904 microsieverts/hour at 5PM on March 12 in Shinzan, also in Futaba-machi. According to Fukushima Prefecture, the monitoring posts in the north of Fukushima I Nuclear Power Plant started to register higher radiation levels in March 12, and the monitoring posts in the south of the plant in Naraha-machi and Hirono-machi in March 15. In the case of Kamihatori, the maximum level was recorded at 3PM on March 12, before the hydrogen explosion at Reactor 1 at Fukushima I Nuclear Power Plant. According to the prefectural government, it was probably because "radioactive materials had been leaking even before the explosion". The prefectural government says it will conduct more detailed analysis including wind directions and wind speed. Now, for Fukushima Prefecture to pretend this was new information (that the radiation had been leaking even before the Reactor 1 explosion), that's highly misleading. 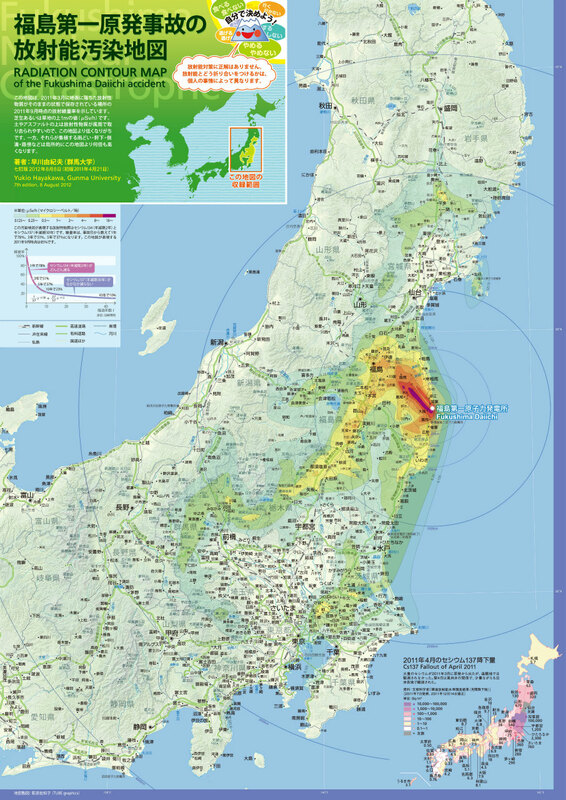 Fukushima Prefecture started measuring radiation levels in the areas surrounding the two nuclear power plants (Fukushima I and II) as early as 8AM on March 12, 2011. The first measurement that would have shown them that the radiation level was already several times higher than normal (0.04 - 0.06 microsievert/hour) was that of Tomioka-machi (Fukushima II) at 0.18 microsievert/hour at 8:25AM on March 12, 2012. At 8:52AM on the same day, they measured 14 microsieverts/hour in Namie-machi. Reactor 1 had a hydrogen explosion at 3:36PM. But what's more interesting about the latest disclosure by the Fukushima prefectural government is that the spikes in air radiation levels coincide not with the explosive events but with the vents that TEPCO did or attempted. Kamihatori, Futaba-machi: The first spike of radiation occurred even before the first vent of Reactor 1 on March 12, 2011. The huge spike to 1590 microsieverts/hour occurred at 3PM, after the vent at 10:17AM and after the pressure of the Reactor 1 Containment Vessel dropped at 2:30PM. Kamiyatori is located northwest of Fukushima I Nuclear Power Plant. On March 12, 2011, the areas that registered high levels of radiation were all located north and northwest of the plant. Then, after the vent of Reactor 2 on 12AM on March 15, 2011 (which was a dry vent), huge spikes in radiation were recorded in the areas in Okuma-machi, Tomioka-machi, and Naraha-machi, which were located south of the plant. The plume that went past Okuma, Tomioka, Naraha reached Kitaibaraki City in Ibaraki at 5:50AM on the same day, registering 5.5 microsieverts/hour. The Japanese media reported it, as possibly caused by the explosion of Reactor 2 (here's Sankei Shinbun on March 15, 2011), and no one understood the significance of the news at that time. Hardly anyone knew what "microsievert" was. Well, it may not have been the explosion that caused the spikes. It is likely to have been the vent - intentional release of radioactive materials to lower pressure to avoid explosions. Well the explosions or some explosive event (in the case of Reactor 2) took place at Fukushima I Nuclear Power Plant after they did the vent. So what was the vent for? That the vent, not the explosions, caused the radiation levels to rise has already been stated by none other than TEPCO in its report. Again, when the report was released, the media paid no attention, and people didn't care (other than the familiar refrain of "TEPCO lies"). A Tokyo University researcher stated in his paper accepted by a peer-reviewed magazine that a huge spike of radiation was registered at Fukushima I Nuclear Power Plant after the Reactor 2 dry vent. Again, no one paid attention. It seems China has decided to expand the sphere of influence further as conflicts start to erupt all over Asia. The last official Chinese visit to Afghanistan was 46 years ago. KABUL, Sept. 23 (Xinhua) -- China's top security official on Saturday made a surprise visit to Afghanistan, the first time in 46 years that a Chinese leader set his foot on the soil of this landlocked Asian country. Zhou Yongkang, a member of the Standing Committee of the Political Bureau of the Communist Party of China (CPC) Central Committee, arrived at the Kabul airport late in the afternoon. The four-hour visit had not been announced by Beijing due to security concerns. It followed a two-day trip of Zhou to Singapore, where he met Singaporean leaders on bilateral ties. Zhou, who is also secretary of the Committee of Political and Legislative Affairs of the CPC Central Committee, will also go to Turkmenistan. The last visit by a Chinese leader to neighboring Afghanistan was made by Liu Shaoqi in 1966 when he was the President of China. During the past half century, Afghanistan was afflicted with series of military coups and two major wars commenced by the former Soviet Union and the United States respectively. The country is still the front line in the U.S.-led war against terrorism and is undergoing daily bombing and bleeding. In Kabul, Zhou was warmly received by Afghan President Hamid Karzai. The two leaders held a bilateral meeting. "It is a priority of China's foreign policy to strengthen good- neighbored relations with surrounding countries. It is the consistent policy of the Chinese government and the CPC to consolidate and develop China-Afghanistan relations," Zhou said, according to a press release from the Chinese delegation. Zhou said China is willing to make due contributions to peace and stability in Afghanistan, which is at a critical transition period. "We will continue to provide assistance to Afghanistan with no attached conditions and sincerely hope the Afghan people can regain peace as soon as possible and build a better home in a peaceful environment," he added. The United States has said that Washington and its allies will completely withdraw their troops from Afghanistan by 2014, leaving the country to stand on its own. Karzai said Afghanistan would like China to be involved in its reconstruction efforts and is expecting China to play a bigger role in the peaceful development of Afghanistan and the region. Official figures showed that by the end of 2011, China's direct investment into Afghanistan stood at about 200 million U.S. dollars and the aggregate contract value of projects undertaken by Chinese constructors in Afghanistan reached nearly 600 million U.S. dollars. In addition, about 20 China-aided projects in Afghanistan were completed between 2002 and 2011. Karzai said China is among the first batch of countries that invested in Afghanistan, which brought concrete benefits to the Afghan people, and Afghanistan welcomes China to expand investment. Ethnic Malay Muslims in southern Thailand inciting insurgency, displaying Malaysian flags. Cambodian Muslims entering Thailand on the way to Malaysia, Thai authority fears they will stay in southern Thailand and join the insurgency. Illegal immigrants from Bangladesh causing ethnic violence in west Assam in India. Maybe the entire Asia is entering another period of incessant warfare that could last a hundred years or more.